2 more days for the kids to practice at school and at home before their spelling bee contest on Saturday. We have been doing so much practice at home in the afternoon. Anything can happened on Saturday but I really hope the kids will do their best. 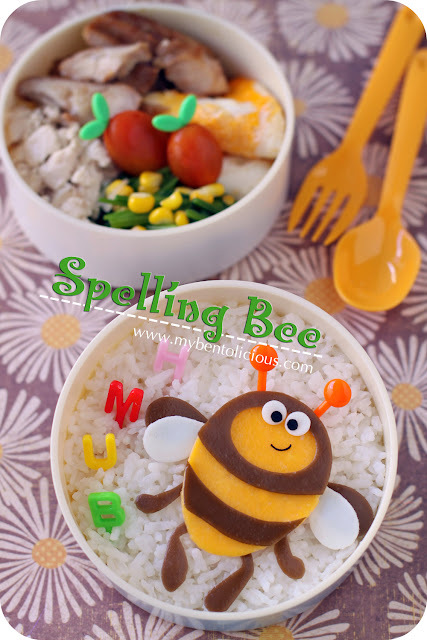 I made a 'spelling' bee for their bento. The bee looks a bit dizzy, maybe it suffers from too much spelling practice LOL :D Instead of 1 hour lunch time. The kids will only have 30 minutes lunch time today because the English teacher will have some tests for them to prepare for the contest. Hope they can finish their lunch quick. Kids were asking for fried rice bento but hey ... Mommy didn't have that 'blank' day anymore this morning, so fried rice bento will be served next time. Inside the boxes : steamed rice, stir fry Chinese spinach and corns, fried egg, pan fried chicken with oyster sauce, mun tofu, and cherry tomatoes. the bee is very cute, Lia! Hopefully your children could practice well and become a winner in the spelling bee contest this Saturday. Good luck. Aw! Supercute spelling bee! I hope they do well with all their preparation! Seems they just had one recently? Best of luck to them! @Journal Mommy Yenny : hahaha ... Thanks a lot Yen! Lol, I love the dizzy eyes! Good luck to your kids at the spelling bee! @karaimame : That's rhyme hehehe ... Thanks a lot Lilian! Like d Bee! Very Cute. How u make d eye? Did u use egg sheet too? Lia, am sure your kids will pass their spelling bee contest and the dizzy bee looks so cute! I love your egg sculpting, I have never done something like this before, but it looks like fun, but I am not sure if I would be able to do it as good as you, because I have never been so good at craft. @Emily Wong : I used white egg sheet and nori for the eyes. Thanks a lot Emily! HI Lia Chen, your little bee is so cuteeee..i like the eyes though haha funny look.... how to make that? can you please guide me? :) is there a cutter to make it and what is egg sheet? @babykins : Thanks a lot Izumi! Sorry to be commenting so late on this one! Love not only the sweet bee but the most clever use of letter picks ever. Happy weekend to you and family, Lia! You are such an awesome bento maker! Your designs are cute and inspirational ! @Egg104 : Thanks a lot for your sweet comment!